Victoria Stanton (Montreal, Canada) is an interdisciplinary artist and researcher/curator/educator who works with live action, human interaction, video, film, photo, drawing, and writing. Continually exploring within such diverse media, while the outward results of her practice may manifest in a multiplicity of forms, performance is the unifying central focus and invariable core of her research. Her time-based work includes performance for stage, performance for the camera, actions in public spaces, and one-on-one encounters in intimate contexts. Investing a performative presence and consciousness within multiple spaces/times, she continuously underscores the complex aspects of “transaction” and the possibility for transformation. Considered a pioneer of transactional practices in Quebec, Stanton has presented exhibitions, performances, infiltrating actions, and films/videos in Canada, the U.S., Europe, the U.K., Australia, Japan and Mexico. Her creative and critical writings have been published in Canadian and American anthologies and art/literary/lifestyle magazines, with one of her articles garnering a finalist position for the Prix de la SODEP in March 2013. Her first book Impure, Reinventing the Word: The Theory, Practice and Oral History of Spoken Word in Montreal (conundrum press, 2001), co-authored with Vincent Tinguely, chronicles a vibrant artistic movement via interviews with over 75 artists. Her second book, The 7th Sense, co-authored with the TouVA collective (Sylvie Tourangeau, Anne Bérubé and Stanton), draws upon a profound exploration of “the performative” in performance art (SAGAMIE édition d’art, 2017). Stanton is the 2018 recipient of the Prix Powerhouse, along with Helena Martin Franco. Much recent work explores the elusive “in-between” – that invisible, liminal space between herself and the audience (whether a group or just one person) or between herself and the object/action/location – whether appearing “on stage” (in a black box, white cube, bar or loft) or “out in the world” (in public sites and “non-art” contexts). Difficult to pin down or define, but present and tangible, it is that grey area – where transitions, negotiations and deliberations occur, where one’s sense of certainty and stable self are called into question – that she finds the most rich with potential and possibility. 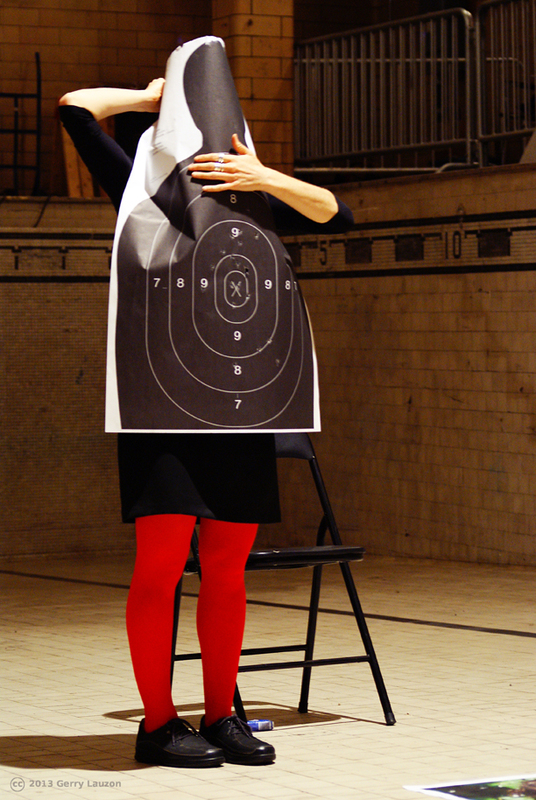 The “in-between” is her inquiry into transitional space: as manifested on stage (has the performance ended? Did she mean to make that incredibly cringe-worthy mistake? ), as presented through relational exchange (is this a performance? Is this Art? Are we supposed to get this close? ), and as experienced out in the world through geopoetic meandering, and the conscious inhabiting of non-places found in the built environment. These subtle forms of testing the limits of vulnerability make up her overall practice (and multiple research processes) as an artist working in – and with – space and time. Upcoming and past solo exhibitions include: Cultural Institute of Mexico in Montreal (Montreal, QC), The City of Saint John Art Gallery (Saint John, NB), 3e impérial (Granby, QC), PAVED Arts (Saskatoon, SK), Tenderpixel Gallery (London, UK), and Galerie Corrid’Art Sylviane Poirier (Montreal, QC). Performances and interventions include: Nuit Blanche (Calgary, AB), LIVE: Biennial of Performance Art (Vancouver, BC), The Works Art & Design Festival and Visualeyez (Edmonton, AB), Hub 14, Art Toronto, Toronto Free Gallery, Performance Studies International #16 – Performing Publics, and 7a*11d Festival (Toronto, ON), InterAzione (Sardinia, IT), Vollevox (Brussels, BE), Festival Infr’Action (Sète, FR), Le Préavis de désordre Urbain (Marseille, FR), Overload Festival (Melbourne, AU), the Leeds Met Gallery (Leeds, UK), Performer Stammtisch (Berlin, DE), Gallery Para Globe (Tokyo, JP), Open Source Gallery (Brooklyn, NY), VIVA! Art Action, HTMlles Festival, OFFTA Festival, Art Qui Fait Boum! Triennial of Emerging Artists, Festival Voix d’Amériques, Festival International Montréal en Arts, Edgy Women Festival, and a captivating appearance on the nationally broadcast television show Des Kiwis et des hommes (Montreal, QC). Video screenings include: Les Rendez-Vous du cinema québecois (2009, 2014 and 2015), Le Festival international du film sur l’Art (2010 and 2012), Vidéos de femmes dans le parc (2009, 2011 and 2015), the Montreal Anarchist Bookfair (Montreal, QC), Festival Images Contre Nature, (Marseille, FR) Traverse Vidéo festival (Toulouse, FR), the Chicago Anarchist Film Festival (Chicago, IL), the 3rd Annual Vancouver Videopoem Festival and Visible Verse 2008 (Vancouver, BC), the Bild-rausch video festival (Saarbrücken, DE), Video and New Media Festival (Lisbon, PT), the internationally touring Upgrade! P2P Outdoor Art Videos and the nationally touring J’ACTE, a program of performance-video curated by Eugénie Cliche (2012). Upcoming and past residencies include: McGill University, P. Lantz Artist-in-Residence (Montreal, QC), DARE-DARE (Montreal, QC), ORANGE, Centre Expression (Saint-Hyacinthe, QC), Salem Art Works (Salem, NY), Praxis art actuel (Ste-Thérèse. QC), Third Space Gallery (Saint John, NB), FRONDA (Real del Monte, MX), 3e impérial (Granby, QC), Centre DAÏMÕN (Gatineau, QC), Centre Vaste et Vague (Carleton-sur-Mer, QC), Centre Sagamie (Alma, QC), and Artexte (Montreal, QC). Publications include: LitLive – Canadian Review of Literature in Performance, Inter, On Site, Matrix Magazine, Ascent Magazine, Canadian Theatre Review, Esse Magazine, Revue ETC, The Portable Conundrum, Career Suicide (the Moosehead Anthology series) and Short Fuse, the international anthology of fusion poetry. Text-sound-song pieces have been broadcast on national radio and featured on a variety of compilations: The Lemon Tape (Montreal, QC), All Points In (Ottawa, ON), Vollevox (Brussels, BE), Going Down Swinging (Melbourne, AU), and Ribsauce (Montreal, QC). Her first book, Impure, Reinventing the Word: The Theory, Practice and Oral History of Spoken Word in Montreal, came about as the result of an active engagement with the Spoken Word community in Montreal, QC. With over 75 artists in Montreal (and New York performance poet John Giorno), this important resource uncovers a multitude of connections between the earliest artist run centres (such as Véhicule Art, Powerhouse, PRIM), the political undertakings of francophone activist poets such as Gaston Miron and Michel Garneau, and the bourgeoning interdisciplinary arts milieu where writers, dancers, video-makers, and musicians came together to contribute to the foundation of a vibrant performance art community. For booking, images or research purposes please contact Victoria Stanton.